Roll labels in either paper or vinyl used for barcodes, product identification, return address labels etc. These can be applied by hand or used with a label applicator for automated systems. Label Overprinting. Our short run high quality label over printing service is second to none and will eliminate the need to purchase expensive label printing equipment when label quantities don't justfiy the investment. Have a base stock of labels printed in larger quantities to save on costs and then let us overprint the individual required for each type of product. Contour Cut adhesive stickers in full colour on gloss or matt vinyl. These are supplied on sheets and can be produced in sizes up to 720mm in width with no limit to their length. 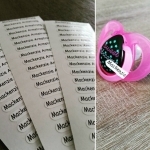 Uncoated printed stickers have an outdoor life of up to 3 years and can be laminated with either scratch resistant or UV laminate to prolong the life of the print. Bumper Stickers are available in quantities as low as 100 and have an outdoor life of up to 3 years. With our ability to contour cut your bumper stickers you can have them cut to any shape and add that little bit extra eye catching interest.